Raise your hand if you remember the 2009 Kia Borrego. A midsize, 3-row, 7-passenger SUV, the Borrego came with a 3.8-liter V6 engine and available all-wheel drive. Unfortunately, it arrived in the U.S. just after the economic meltdown of 2008. Sales were downright dismal. Kia yanked it from the lineup after just one model year. A decade later, amid record low unemployment rates and record high stock market gains, Kia is giving the concept another go. This time around, the SUV is called the 2020 Kia Telluride. Like the Borrego, it is a midsize, 3-row crossover, but with seating for eight people instead of seven. A 3.8-liter V6 engine is standard, and all-wheel drive is available. Designed in California and built in Georgia, the Telluride shares its platform and underthings with the Hyundai Palisade. When it goes on sale in spring of 2019, it will be available in LX, EX, S, and SX trim levels. 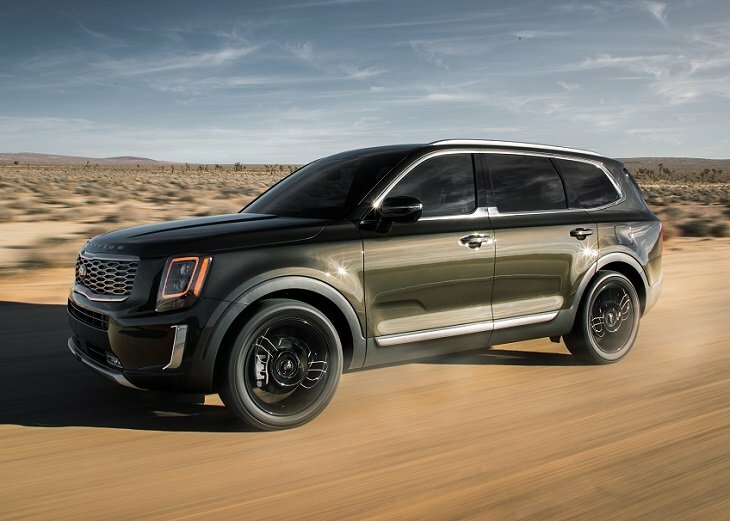 Kia says the Telluride is deliberately “big, bold, and boxy” like a classic SUV, in order to convey a “go-anywhere, do-anything” attitude. Key design elements such as the wide grille, stacked headlights, upright windshield, and vertical taillights convey a burly ruggedness, underscored by oversized TELLURIDE lettering stretched across the leading edge of the hood and on the tailgate. The end result is appealing, and the new Telluride will no doubt find success where the Borrego did not. Depending on the trim level, Kia uses simulated brushed metal or simulated matte-finish wood trim to decorate the interior. Every Telluride has a leather-wrapped tilt/telescopic steering wheel and grab handles incorporated into the center console, as well as a second-row overhead climate control system with diffusing ceiling vents. Reclining third-row seats are also onboard. Among the non-technical options that Kia detailed for the new Telluride, the SUV will offer comfort upgrades in the form of double-stitched, quilted, and padded Nappa leather upholstery; heated and ventilated front- and second-row seats; and a heated steering wheel. Unlike the Borrego, which could be optioned with a V8 engine, the Telluride offers just one power plant. It’s an Atkinson-cycle 3.8-liter V6 making 291 horsepower and 262 lb.-ft. torque. Given the way the industry is moving, a plug-in hybrid might one day become available. An 8-speed automatic transmission powers the SUV’s front wheels. As an option, the Telluride is fitted with an active on-demand all-wheel-drive system that offers Normal, Snow and AWD Lock settings. Smart, Eco, Sport, and Comfort driving modes adjust the steering effort level, engine and transmission response, and default AWD power split. Because the AWD system is active, though, it continually varies the split of power between the front and rear axles as conditions warrant. Downhill Brake Control is standard, and the EX and SX trim levels include a self-leveling rear suspension. The Telluride’s standard towing capacity is 5,000 pounds. Kia is serious about safety, and that starts with the Telluride’s underlying structure, which is composed of nearly 60% high-strength steel. Two additional safety-related systems are included on every 2020 Telluride. Safe Exit Assist detects if an object is approaching from behind and prevents occupants from opening a door into the path of the oncoming vehicle or cyclist. Rear Occupant Alert uses ultrasonic sensors to detect child or pet movement for up to 24 hours after the doors have been locked, and then issues audible alerts and UVO text-message notifications to driver if it senses movement within the vehicle. Front parking sensors are an option, as well as Lane Following Assist and Highway Driving Assist. Lane Following Assist works with the adaptive cruise controls system to keep the SUV centered in its lane. Highway Driving Assist is a semi-autonomous driving aid that maintains a safe following distance from the vehicle ahead, adjusts speed to the local limit, and keeps the SUV centered in its lane. Kia equips the Telluride with standard Apple CarPlay, Android Auto, and UVO telematics with remote access to several vehicle functions. The UVO system is free for the first year, and then requires a paid subscription. Five USB ports are sprinkled around the cabin: 2 front, 2 second row, 1 third row. Upgrades include a wide 10.25-inch touchscreen infotainment display, Bluetooth connectivity for two phones at the same time, a navigation system, a 10-speaker Harman Kardon surround sound system, and wireless smartphone charging. An available Quiet Mode plays music or media only up front so that people in back can sleep, and the optional Driver Talk system allows the driver to communicate with second- and third-row occupants through the stereo speakers. Additional extras include a surround-view camera system and a head-up display that shows local speed limits, turn-by-turn navigation display, cruise and blind-spot warnings, and more.